This Wat is made of white Carrana marble so hence its tourist name, Marble Temple; this most recent of royal Wats was built at the turn of the century under King Rama V. The largest Bot is a prime example of modern Thai architecture. The courtyard behind the Bot exhibits 53 Buddha images (33 originals and 20 copies), representing famous images and styles from all over Asia, Thailand and other Buddhist countries. It is an excellent place to watch religious festivals and moonlit processions. Unlike most other temples, monks don't go out seeking alms but are instead visited by merit-makers between 06:00 and 07:00 hours. The Palace was built in the reign of King Rama V using marble for construction in Italian Renaissance architectural style. 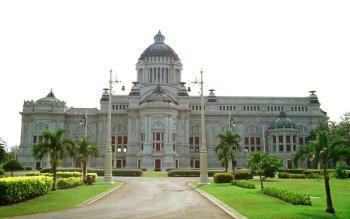 King Rama V desired to use the Palace for receiving foreign dignitaries and meetings of the Royal Advisory Council for national development. 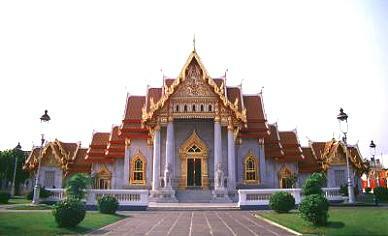 The Palace was completed in the reign of King Rama VI. The ceiling of the dome was highlighted by exquisite fresco Paintings of important Royal functions during the reign of King Rama VI of the Royal House of Chakri. Anandhasmakhom Palace was primarily used to hold important royal and state ceremonies and for parliamentarian meetings. After, the new Parliament building was erected at the back of the Palace, parliamentian meetings were transferred there. However, ceremonial openings of its first session, graciously presided over by His Majesty the King, are still conducted at the Anandhasmakhom Palace.